From our dock at Clearwater Beach Municipal Marina we proceed to a pre-established area off the coast of Clearwater Beach. 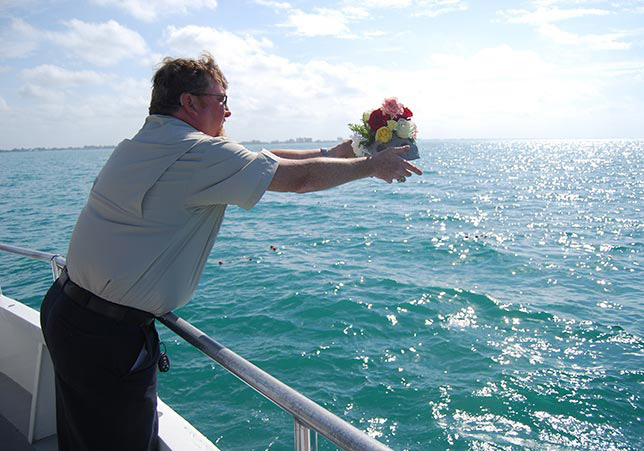 To honor the memory of your loved one we will hove to, so friends and family can say their final good byes as the scattering of ashes and flowers are dispersed in the water. The Captain and crew of the Schooner Clearwater understand the importance of a dignified burial at sea, so we are happy to help you with planning the perfect gathering to say good bye. Plan on a 2 hour charter, typically in the morning due to calmer seas.